The northernmost New England state, Maine is famous for its lobster and known for its exquisite scenery, especially along the coast. This fair state is even the No. 1 exporter of blueberries and toothpicks, of all things. Imports or exports; we paid no mind to such jargon while crafting our latest Top 10. Rather, it’s Maine spa resorts that promise to do the transporting – of your body and mind, of course. From oceanfront estates that stretch out into Atlantic waters to sanctuary-like inns hidden away in alpine villages, our Top 10 Maine Spa Resorts list is truly a celebration of this East Coast destination! Work takes a lot out of you. From the (sometimes) mental anguish to the pure physical toll that most jobs exact, your body and mind really take a pounding. Every now and then, even the most hardy worker needs some relaxation to restock and rejuvenate themselves. Enter Sebasco Harbor Resort, whose sole purpose is to make your live as easy as possible during the entirety of your stay. Bring your family or come alone and enjoy their multitude of peaceful, life-affirming activities. Hit the bike trails and golf course for some exercise, or throw on a swimsuit and jump into the oceanfront saltwater pool. Of course the main draw here, the reason Sebasco draws people from all over the country, is their immaculate Fairwinds Spa. Cleansing facials, deep-tissue massages, pampering pedicures and restorative body treatments are all options, whatever you need to get your body and mind to a relaxed and healthy state. When you aren’t relaxing out and about, go relax in either your Lighthouse room or a romantic suite. Whatever strikes your fancy! The state bird of Maine is the Black-capped chickadee. Slip into seaside serenity at Bar Harbor Inn & Spa, where a host of rejuvenating spa treatments await. Breathtaking natural scenery combines with soothing spa options to transport you to a world of pure relaxation! State-of-the-art facilities, world-class service, and a variety of spa treatments will nurture your body and mind. Change into plush robes and slippers and enjoy complimentary fresh fruit, coffee, and tea. Body wraps, heated stone massages, facials, and much more highlight this relaxing retreat. Unwind in your room with ocean views from you private balcony and indulge in fresh seafood and other culinary creations at the onsite Reading Room Restaurant. Once your body is healed, head out and explore the vibrant Bar Harbor area. View the sights on a nature cruise with Acadian Nature Cruises, and try some deep sea fishing with Downeast Windjammer. The Acadia National Park, only steps from the inn, has all the outdoor fun you’re family is longing for. And, the Oceanarium and lobster hatchery are must sees. The Special Spa package includes a two-night stay, two 50-minute Swedish massages, dinner for two at the Reading Room Restaurant, and full breakfast for two each morning. Take I-95 to Bangor, exit 182 A (formerly exit 45A), continue on I-395 to exit 6A, and drive East on Rt. 1A to Ellsworth, then Rt. 3 to Bar Harbor. Our No. 4 spot’s Victorian architecture is a striking contrast to the cookie-cutter Cape Cod-style structures that surround it. Its idyllic location fronting aquamarine Atlantic Ocean waters gives the feeling of vacationing worlds away. And with recent additions including a first-class spa, the Beachmere Inn only gets better with age! The Beachmere Inn’s all-suite building, Beachmere West, devotes an entire level to pampering at the resort’s all-new spa. If you ask us, they should have named it Beachmere North, as this stunning tower is home to a wide range of spa services that are simply divine. It’s also home to a collection of equally luxurious suites, in the event the Beachmere spa proves too tempting to leave. With modern amenities like flatscreen TVs and two-sided fireplaces, these Maine accommodations are a delightful addition to Ogunquit’s historic charms. Family-owned since 1937, the Beachmere Inn is no slouch when it comes to friendly service and hospitality. The Hearthstone Cottage, with its spacious backyard and barbecue, has all the home-style comforts required for extended stays or Maine family reunions. Even the more humble seaside inn rooms come well equipped, with kitchenettes that make it easy to turn the day’s catch into a tasty shore lunch. If the thought of slaving over a hot stove isn’t your idea of a vacation, Bawdy Sally’s pub-style fare is a hassle-free alternative. The Beachmere Inn’s original Victorian building was constructed in 1897 as a private residence. Located in the heart of Maine’s Southern coast and tucked into the historic town of Ogunquit, the Meadowmere Resort is one of those rare accommodations that entertains and delights year-round. In fact, we can’t find a single thing to dislike about a New England resort whose motto is bringing you Maine, one season at a time! While other Maine coast resorts choose to close their doors at the first sign of frost, Meadowmere Resort offers the best of Ogunquit in every season. The nearby Beaches of York are the center of every summer vacation, while Kennebunkport history and Wells antique shops are well within driving distance. Closer to home, Ogunquit’s shops and museums are worthy of a visit – rain or shine. And our personal favorite, the Meadowmere Day Spa, is one of those places where we could spend eternity and never grow tired. From learn-to-surf escapes to culinary vacations, we can’t imagine a finer start to a whole new year than a Maine getaway. Nothing inspires one to turn over a new leaf like the resort’s Mind, Body, Spirit spa package. This inspiring trio includes a personal wellness consultation, power yoga lessons and a relaxing Swedish massage. Plus, extended checkout to leave you feeling refreshed, even as you bid farewell to your Ogunquit spa sanctuary! The Meadowmere is a AAA Three-Diamond Resort. Wireless Internet, heated pool, Jacuzzi, fitness center, spa treatments, smoke-free rooms and cable TV. Seaside serenity awaits on Maine's majestic coast at The Cliff House Resort & Spa. The full-service spa pampers guests with an array of treatments, exceptional amenities, and sweeping Atlantic Ocean views. A sense of ease washes over you before you even receive a treatment at the Cliff Spa. Sitting atop the dramatic cliffs on Maine's rocky coast, the ocean views set the perfect ambiance. Rejuvenation truly begins when you indulge in any of the signature spa treatments, which are inspired by the coast. Choose from a Maine Wild Rose Body Wrap, Stone Massage with heated rocks from the cliffs, or an Atlantic Antioxidant Facial. Experience a truly relaxing treatment that pays homage to the landscape. The amenities are just as spectacular as the treatments. The spa showcases 10 treatment rooms, a sauna, a steam room, a relaxing spa sitting area, a state-of-the-art fitness center, an outdoor stone meditation labyrinth, a 75-foot indoor heated pool, and an infinity edge outdoor pool. The seasoned staff will have you in a world of relaxation with body treatments, massages, skin treatments, manicures, and pedicures! Choose from a variety of massage treatments that include deep tissue massages, hot stone massages, hot towel massages, and customized massage therapy. While the spa truly is an invigorating experience, you can also receive in-room spa treatments. If you're tight on time, express treatments like head, neck, and shoulder massages offer plenty of pampering in a portion of the time! Our No. 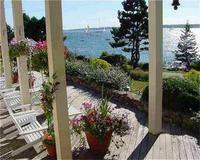 5 East Coast retreat calls Boothbay Harbor home, and is named for the scenic peninsula it overlooks. There’s much to love about this Maine accommodation, but we think its seaside locale, gracious hospitality and intimate proportions make the Spruce Point Inn Resort and Spa especially suited to romantic getaways. With your choice of stunning accommodations, the Spruce Point Inn lets you live as much or as little as you choose. With their rolled stone fireplaces and private decks, the resort’s summer cottages are a Maine coast mainstay with ample space for your group or family getaway. Condos offer the same spectacular ocean views, with added amenities like private porches and modern kitchens. But for all their unique styling and décor, even Spruce Point’s beautifully-appointed inn rooms can’t hold a candle to the spectacular Maine coast scenery. Tucked into a cluster of its namesake trees, the Spa at Spruce Point channels its pristine surroundings into offerings like the Spruce Signature Facial and Organic Herbal Mud Wrap. And a step outside its doors reveals a wealth of recreation at a more leisurely pace. Charter a schooner for a sunset sail, lounge by the saltwater pool or slip into a waterfront hammock and watch lobster boats unloading the day’s catch in Boothbay Harbor. Peruse Boothbay Harbor’s village shops and galleries for your own Maine coast souvenir to treasure. The Spruce Point Inn Resort and Spa has been recommended by The Knot as one of the most Idyllic Destination Resorts on the Coast of Maine. Surrounded by panoramic vistas of the Maine coast, Atlantic Oceanside Hotel & Conference Center is the premier location for your next rejuvenating spa excursion. Perched on 12 acres of expertly manicured lawns and lush gardens overlooking scenic Frenchman Bay, Atlantic Oceanside Hotel & Conference Center provides a tranquil experience for all who visit. The resort is located on the outskirts of Bar Harbor, placing you in the middle of the picturesque Maine wilderness, while leaving you close to all the activities the town has to offer. The accommodations, customer service and amenities of the resort are second to none. They offer a wide selection of lodging options that range from private cottages and townhomes to their beautiful guest rooms. All of their accommodations are tastefully decorated and loaded with perks such as unmatched views from your private patio, comfortable beds with deluxe linens for your comfort, refrigerator, microwave and the list goes one. Some of the more high end lodging options include comforts like full kitchens, spacious rooms, fireplaces and a large deck. A major attraction of this resort is their world class state-of-the-art spa facilities. You’ll be rested and reinvigorated as you experience their selection of spa treatments, facials, skin care therapies, massages and their manicures and pedicures. For a spa experience that you’ll cherish for years to come, make you reservation today with Atlantic Oceanside Hotel and Conference Center. The resorts offers a spectrum of specials and packages for you to take advantage of. From romantic packages to couples to sightseeing packages, they have a deal for you. Contact their friendly customer service team for more information. Bar Harbor is located on Mount Desert Island, it covers 108 square miles and it's the largest island on the Maine coast. The Samoset Resort takes the pristine beauty of the Maine coast, enhances it with a choice location overlooking Penobscot Bay and tosses in its own lushly manicured grounds for good measure. Top off the exquisite scenery with more than a century of service and you’ve found your complete Maine vacation! At least it might be a complete vacation at those other resorts dotting the Maine coast. Fortunately for you, the Samoset Resort wasn’t content to be on par with its competition, which is why it recently unveiled a new face, new amenities and new adventures for a whole new era of Maine vacations. It kept its 230 oceanfront acres, of course – even the Samoset Resort can’t improve upon perfection. Besides, the resort’s premier Atlantic Ocean real estate doubles as a site for countless improvements, including a sparkling freeform pool, a kids’ camp in summer months and a championship golf course with seven holes laid out at the ocean’s edge. Impressive, to be sure, but none of these Samoset Resort offerings compare to the indulgence of its spa services. A full body massage, facial or rejuvenating combination of the two is the perfect way to unwind before returning to the absolute comfort of the Flume Cottage – the resort’s exclusive luxury home perched on a Penobscot Bay peninsula. The Samoset Resort offers four unique dining experiences including Marcel’s, Splash Pool Bar, Breakwater Café and the Clubhouse Grille. In addition to its year-round Maine coast luxury homes, the Samoset Resort also offers 178 equally luxurious hotel rooms and suites with private balconies or terraces. French country meets Maine coast at our No. 9 spot, a New England spa resort that only came into existence a short time ago, despite decades of dreaming. Harborside Hotel and Marina is the latest to hit the downtown Bar Harbor scene – a well-rounded destination where summer romances and spa getaways go hand-in-hand! A crowning feature of any Harborside Hotel stay, the Bar Harbor Club Spa serves as the focal point of this oceanfront retreat. Inside this Tudor-style building, a restful palette of golds, greens and blue-grays takes each visit beyond relaxation and into total restoration. From therapies that center on the healing power of human touch, a la the Blissful Stone Retreat, to body wraps that nourish with ingredients plucked from faraway lands, this Maine spa promises to transport mind, body and soul to another place and time. Just past the spa, a wine bar is perfect for poolside dining or drinks before dinner at the exclusive Club Dining Room. Those looking to skip the vino in favor of something with staying power will find comfort in the Vanderbilt Lounge, a sophisticated space with the styling you’d expect from such a well-known name. Expensive bourbons, cognacs and ports are worth every penny, and when sipped to the beat of the lounge’s trademark jazz classics make for exceptional post-dinner aperitifs! The Bar Harbor Club was once a playground for Bar Harbor elite, including summer residents like Joseph Pulitzer and John D. Rockefeller, Jr.
Oceanfront Jacuzzi, fitness room, coin-operated laundry, pier and full marina, whale watching charters, walking paths and eco-friendly transportation. Our No. 10 spot finds us in an East Coast sanctuary so spectacular, we hardly feel right calling it a spa. Which is not to say that the Senator Inn and Spa doesn’t fit the criteria; with an astonishingly diverse menu of massages, facials and manicures, it most certainly does. It’s just that there’s so much more than “spa” to love about this Maine resort! There’s more to the Chocolate Treat for Hands and Feet than clever rhyme scheme. This indulgent offering begins with a rich truffle to tempt your tastebuds, continues with a cocoa cocoon of mocha-infused scrubs and body butters, and ends in a chocolately treat for your fingers and toes. With so much Hershey-inspired goodness wrapped into one tasty package, chances are your soul won’t be the only thing awakened. When your inner being (some call it a tummy) begs for food, the inn’s Cloud 9 restaurant answers its call with heaven-sent cuisine! The spa at Senator Inn sets the bar pretty high, but accommodations like the Presidential Rooms continue where the spa indulgence leaves off. Muted color palettes of blue and green lend their calming presence to this Maine hotel suites, while plush furnishings swathed in rich velvets make them worthy of their prestigious names! So stressed that a simple hour-long spa treatment just won’t do? Treat yourself to the Senator Inn’s Day of Relaxation package and its sea salt body polish, anti-aging facial, one-hour massage, spa pedicure, spa lunch and spa recovery drink. Take I-95 North. In South Portland, take Exit 6A for I-295 North. Follow I-295 through Portland until it once again becomes I-95, just past Falmouth. Continue North for approximately 50 miles. After the Gardiner toll booth, go 7 miles to Exit 109 in Augusta. Bear right off the exit onto Western Avenue. The Senator Inn is immediately on your right.